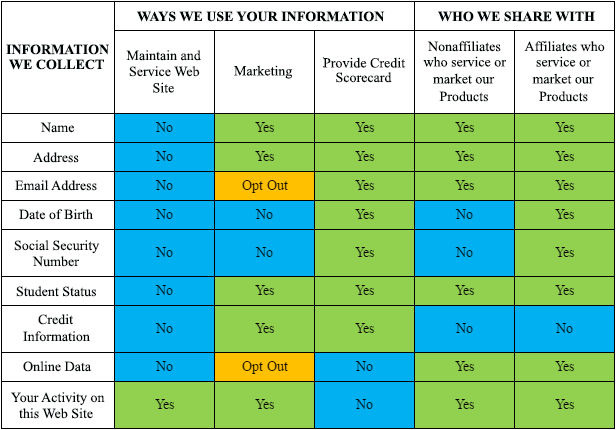 This Credit Scorecard Privacy Statement ("Privacy Statement”) describes how Discover Bank (“Discover”) treats your Credit Scorecard information, including information we obtain online as well as when you interact with us on social media sites. You may cancel Credit Scorecard at any time. Please be aware that for a short time, you will continue to receive information about Discover products in connection with Credit Scorecard. Cancelling Credit Scorecard will not impact your receipt of other marketing messages from Discover unrelated to this product. For Credit Scorecard Terms click here. “Yes” - We will collect, use and share your information in this way unless you cancel Credit Scorecard. “No” - We will not collect, use or share your information in this way. “Opt Out” - We will collect, use and share your information in this way unless you tell us not to by opting out or you cancel Credit Scorecard. Affiliates – Companies related by common ownership. Nonaffiliates – Companies not related by common ownership. Online Data - Online Data includes tracking tools such as, cookies and pixel tags. We or our service providers may gather online data about you over time across multiple websites, other platforms, or other mobile apps. We do not allow any other third parties to collect personally identifiable information about you or your online activities over time and across different sites when you visit the Discover Credit Scorecard website. You can update your account profile by clicking your profile in your scorecard. You may stop receiving our Credit Scorecard marketing e-mails without revoking consent by following the instructions in the promotional messages you receive from Discover. For more information on our online advertisements, please see below. We conduct interest-based advertising. You may see Discover advertisements on other websites you visit from time to time. Some of these ads are based on your information we collect. This is called interest-based or online behavioral advertising. Discover uses interest-based advertising to target its advertising more effectively. These ads might be served on websites or on apps. They might also be served in emails. We might serve these ads, or third parties may serve ads. First, you can opt-out right from the ad itself. Ads served using interest-based advertising will have an Advertising Option icon in the ad. If you see that icon on Discover ads, you can click on it. You will then get an option to opt-out. Second, the Self-Regulatory Program for Online Behavioral Advertising program provides consumers with the ability to opt-out of having their online behavior recorded and used for advertising purposes generally. If you opt out via methods above, your choice will be stored as a cookie. If you remove or delete cookies you will need to renew your preferences. Your choices are also device and browser-specific. We do not respond to browser-level "do not track" settings. However, your browser may give you the ability to control cookies. How you do so depends on the type of cookie. Certain browsers can be set to clear past and reject future cookies. If you block cookies on your browser, certain of our features may not work. Additionally, if you block or delete cookies, not all of the tracking activities we have described here will stop. Choices you make are both browser and device-specific. This Privacy Statement is effective as of November 28, 2018. We may change this Privacy Statement from time to time. We will notify you of any material changes as required by law, such as by posting the revised privacy statement on this page with a new “last updated” date. Please check this website periodically for updates. This Privacy Statement was last updated November 28, 2018.